Registration deadlines for two key CME events! Springfield Essential Evidence March 9 and National Procedures Institute March 10. Two separate events in the same location! Separate registration for both events closes at Midnight MARCH 5. March 9 is the Essential Evidence CME format with 6.25 CME credits available on a wide array of timely topics. View the schedule here. Chicago Essential Evidence - March 23-24 This incredibly popular, fast-paced CME returns with up to 12.5 AMA PRA 1 credits available. One day registration option and new physician discount for those less than seven years into practice! UIC Department of Family and Community Medicine faculty and other experts will provide the CME you can put into practice right away. Online registration closes March 19. New physician discount, one-day option and FREE for resident members! Member Interest Groups (MIG) provide an avenue for IAFP members across all levels (active, life, resident and student) to connect and collaborate on a topic of interest or situation of common ground. IAFP has three current MIGs: Women in Leadership, FPs in FQHCs and Direct Primary Care. We have four proposed/developing MIGs looking for members. Learn more and join the one(s) that fit your interests! We have two opportunities in March for MIGs to "meet up" in conjunction with the Essential Evidence CME conferences. Send us your FP of the Year Nomination! Nominations are due June 1 and our NEW online form makes it easier than ever to nominate a deserving IAFP member. For those members who are teaching Tar Wars in their local schools, make your plans for entering the state poster contest! Deadline is April 30. Details are on our Tar Wars web page. Link to Crain's article with details. Link to IAFP's Medicaid MCO resources. 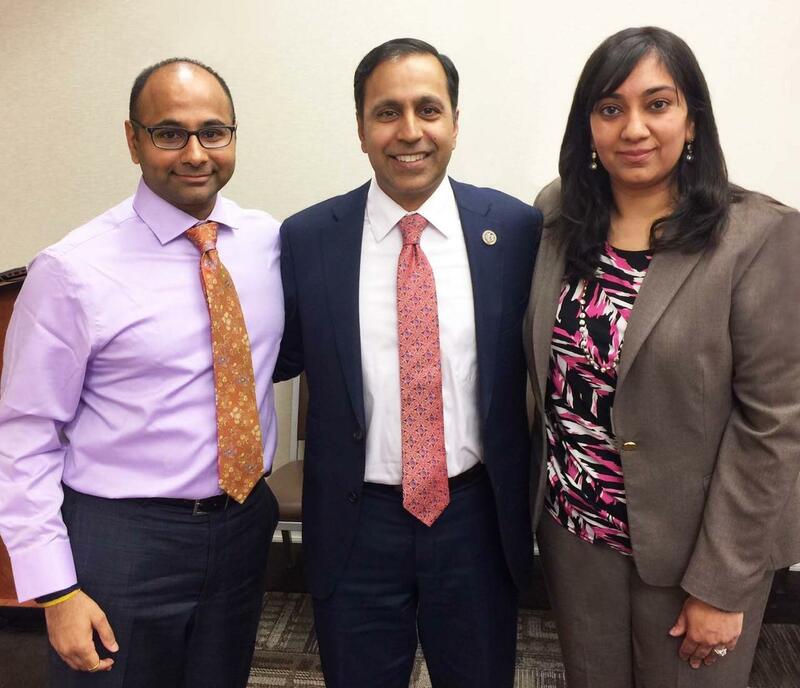 IAFP Board Chair meeting with new Congressman "Raja"
Alvia Siddiqi, MD, IAFP board chair and constituent of freshman U.S. Rep. Raja Krisnamoorthi, participated in a roundtable discussion of health care leaders to provide the Congressman with input on how a repeal of the Affordable Care Act can impact Illinois. Topics included the impacts of repeal on those with employer-sponsored health plans, the most positive aspects of the Affordable Care Act on patient health outcomes, and participants' concerns about turning Medicaid into block grant programs. "At the roundtable, I emphasized the quadruple aim, increased access to preventive screenings, need to address decreasing primary care work force shortage, public health and primary care intersections, total reductions in total cost of care were possible through the ACA," reports Siddiqi. "I recommended using this opportunity to make refinements to ACA and solve the 'pain points' around premiums and high deductibles without adequate drug coverage, as well as improvements to protect providers from non-payment when patients don't make their premium payments. Active members received an email from IAFP President Donald R. Lurye on Tuesday with information to help you stay on track with the MACRA requirements for 2017. Click here for the contents of that email, including links to tools you can use to pick your pace and stay MACRA ready. EXTENDED DEADLINE DATES FOR E.H.R. ATTESTATION: The Centers for Medicare & Medicaid Services Registration and Attestation System is now open. Providers participating in the Medicare EHR Incentive Program must attest to the 2016 program requirements by MARCH 13. 28, 2017 at 10:59 p.m.(CT), in order to avoid a 2018 payment adjustment. The EHR reporting period was any continuous 90 days between Jan. 1 and Dec. 31, 2016. Timeline: First-time participants must register with CMS by March 13, 2017, in order to begin participation in the EHR Incentive program. First-time participants who miss the Feb. 28 deadline, will not be able to begin participation, as 2016 was the last year to begin participation. First-time participants must register and attest by March 13, 2017 in order to avoid the payment adjustment in 2018. First-time participants must register by March 13, 2017 in order to begin participation, but the last date, for Medicaid participants to attest is March 31, 2017. Any first-time participant who bills Medicare Fee For Service, may be subject to the payment adjustment in 2018. Don't look for License renewals in your mailbox! This year the Illinois Department of Financial and Professional Regulation (IDFPR) will no longer mail renewal notifications, relying instead on email. If IDFPR does not have your email address you will not receive the reminder nor the PIN number required for online license renewal. Take time now, in advance of the renewal window, to visit IDFPR's Address Change - Lookup web page to assure your correct mailing address, email address and telephone number are registered. You will need to provide your medical license number, social security number and date of birth to access your information. The Department of Healthcare and Family Services (HFS) has launched a secure electronic web-based portal to assist providers statewide in resolving issues with Illinois Medicaid Managed Care Organizations (MCOs). The new MCO provider complaint portal does not replace issue reporting and escalation processes already in place between providers and an MCO. Prior to submitting a complaint through the new online portal, issues must already have been submitted to and reviewed by the MCO in question. The link to the complaint portal may be found on HFS' Care Coordination Webpage, or may be accessed directly from the HFS Managed Care Provider Complaints webpage. The portal is available for immediate use. ABC-D Conference Registration is open! Registration is now open for the Illinois Chapter, American Academy of Pediatrics' (ICAAP 3rd Annual Autism, Behavior, and Complex Medical Needs-Downstate (ABC-D) Conference, "Zip Code vs Genetic Code: The Social Determinants of Caring for Children and Families with Special Needs." Alex Garrido, MD of Carbondale appeared live on WSIL-TV morning show on Feb. 20 to talk about the recent flu outbreak and to remind viewers to get the flu shot and how to recognize symptoms. Jerry Kruse, MD, Dean of SIU School of Medicine appeared in CBS National morning news and nightly news stories on Februrary 21, discussing how the first travel ban issued by President Donald Trump could prevent foreign medical graduates who matched into U.S. residency programs from entering the country. The result could further strain the supply of physicians, including primary care, as these overseas graduates often fill vacancies in underserved areas. Samuel Grief, MD was quoted in a February 21 CNN NewsSource article on a new study showing that group support and regular interventions can be more effective in treating obesity and sustaining weight loss. Howard McNair, MD of Orland Park provides a nice explanation of the ketogenics diet, along with the benefits and risks, in the February 22 Orland Park Patch.